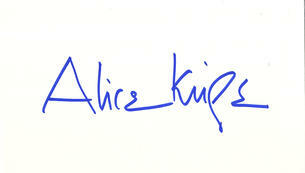 This is an In Person signed 6.25" x 3.75" white card by the South African Actress. Alice Maud Krige ( born 28 June 1954) is a South African actress and producer. Her first feature film role was in Chariots of Fire (1981) as the Gilbert and Sullivan singerSybil Gordon. Since then, she has played a variety of roles in various genres. Krige first played the role of the Borg Queen in the motion picture Star Trek: First Contact and reprised the role for the final episode of the television series Star Trek: Voyager. A year after the series ended, she reprised the role in "Borg Invasion 4-D" at Star Trek: The Experience.